Find the colleges that will recruit you to play college baseball. The fundamental fact of college baseball recruiting is that you can’t be recruited if the coach doesn’t know that you exist. Gone are the days of a player being spotted at their local high school game. What they need to do is to find the colleges that will want them. But there are over 1,500 colleges that offer baseball programs. How do you decide from over 1500 colleges? Division Level and Conference indicates the general competitive level of the school. You can make a good first cut with this information. Three of the four final schools my son was considering were in the same conference. More than likely, you won’t have a scholarship and will be paying the tuition bill yourself. You need to know the Average Net Price so that you know what kind of bills you’ll be looking at. Graduation Rates indicate your chances of graduating if you deciding to quit playing baseball. Will there be anyone in the stands? Are students generally involved with campus activities? In other words, is anyone going to care about the baseball team? The higher the percentage of students who are part-time and the lower the dorm availability, the more likely the college is a commuter campus with less student support and involvement. How much does the college care about baseball? Knowing how much a school spends on baseball compared to other sports or other schools in its conference shows the relative importance of baseball at the school. All of this information is readily available for colleges and can be found through various college search websites. But you can’t find all the information for all of the colleges that offer baseball programs in one place for you to sort as needed–except here. 36 D1 teams had operating expenses less than $100,000. 154 Private Colleges had an average net price for families with income over $110,000 less than $20,000. 302 colleges had an average SAT less than or equal 1000. The DIY College Rankings for Baseball Spreadsheet has all the information you need to know to create your college search list. What you get: All four-year and two-year colleges with baseball programs are listed. The data is already sorted into tabs by NCAA divisions, NAIA, NJCAA, and NCCAA. You can search by ACT or SAT scores. The total cost and the average net cost by family income is included. You can look-up four and five year graduation rates for each four year college as well as its admissions rate. Basic school characteristics are provided as indicators for school culture. You can easily compare the colleges’ financial commitment to baseball. 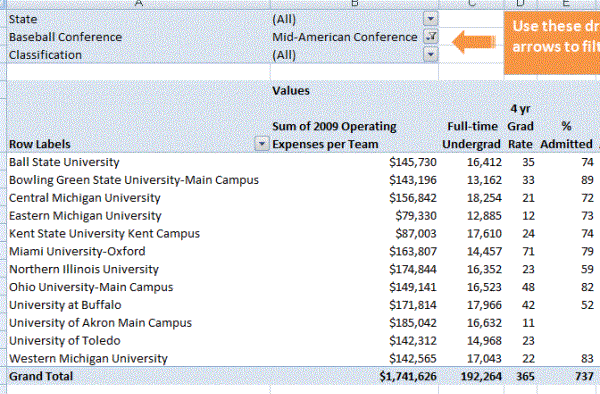 And you can easily select colleges through filters with the pivot table. The spreadsheet also includes separate tabs of all colleges with a graduation rate of 50% or higher and a listing of the total number of baseball programs available by state and type. (The spreadsheet is in Microsoft PC 2007 Excel format. You must have Microsoft 2011 for the Mac in order to use this file. Best of all, if you aren’t happy with it for any reason, let me know within 60 days and I’ll refund your money, no questions asked. And keep the spreadsheet, with my compliments. For only $24.00, take control of the baseball recruiting process by selecting colleges that will recruit you. The spreadsheet is in Microsoft PC 2007 Excel format. You must have Microsoft 2011 for the Mac in order to use this file.